In honor of the infamous Shark Week on the Discovery Channel, we're biting back by offering mako shark on the menu. 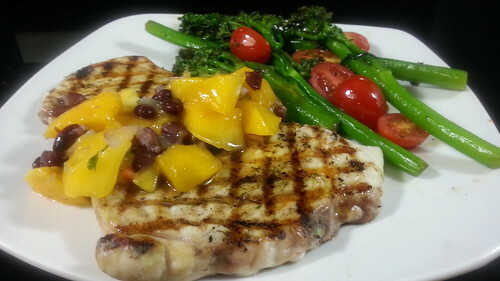 Grilled to perfection and served with our housemade black bean mango salsa, this dish is paired with your choice of our special seasonal vegetables of sauteed broccolini in white wine and plugra butter with cracked red paper flakes or our freshly steamed vegetable mix. Mako shark is moist and slightly sweet with a full-bodied, meaty taste. Both flavor and texture are similar to swordfish, but the flesh of the mako is moister, and the meat is not as sweet. Fresh, raw mako is very soft and ivory-pink or a muddy, reddish color that turns ivory white and firm when cooked and is often mistaken for swordfish meat. Along with our new tablet menus and our fresh summer selections, mako shark is an exotic dish that will rarely be found anywhere else in this parts. Working perfectly with our fresh heirloom caprese salad and glass of red wine, it's the perfect (and healthy) way to keep those warm summer nights here just a little bit longer.